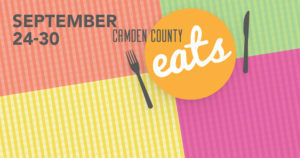 (Camden, NJ) – The Freeholder Board has initiated a new event, commencing this week in support of our Shop Local Campaign called Camden County Eats. This event, spanning from Sept. 24 to Sept. 30, has a variety of local restaurants offering special offers and price fixed menus to entice local spending that will boost job growth and small businesses throughout the region. Every year the Board initiates events promoting the importance of spending money locally making our county a more vibrant place and enhancing our community’s quality of life through the Shop Local initiative. Freeholder Director Louis Cappelli talked about the benefits of patronizing local restaurants who are major financial contributor to the local economy in so many towns throughout the county. If each household in Camden County transitions just $10 per month of their out-of-county retail spending to in-county spending, the economic benefit to the county would be approximately $35 million per year. Cappelli went on to talk about local restaurants being the lifeblood of a local economy.